What are the different kinds of DJs? What is the best podcast for DJs? Should DJs use “sync” (automatic beatmatching)? What is a “real DJ”? Where can I get more education on DJing? What is the best DJ software? What is the best DJ controller? What is the most expensive DJ hardware? Why do DJs need headphones? Why do DJs use laptops? How do you DJ with an iPad (or other tablet)? Why do DJs use CDJs? Are they better than controllers? How much does it cost to start DJing? Who is the highest paid DJ? What’s the average DJ salary? Is DJing a good career? Is it okay to DJ for free? What are the biggest struggles of a DJ? In the traditional sense, a DJ (short for disc jockey) is a person who actively plays prerecorded music for an audience. This audience might be dancers at a party, patrons at a nightclub, or listeners of a radio show. Over time, the role of the DJ has evolved into many aspects of musical performance. Modern DJs are often involved in the remixing, production, and live presentation of music and its components. Thus, the term can have varied meanings. There are four main types of DJs: Club DJs, Turntablists, Mobile DJs, and Radio DJs. Of course, many DJs have overlap with several of these roles. Club DJs are tasked with maintaining a moving dance floor, making sure that the drinks continue to flow. Turntablists perform their art through the use of cutting, scratching, and exhibitionism. Mobile DJs are the ones you see playing at weddings and corporate events. And Radio DJs are the ones that started it all! Another term you’ll hear is DJ/Producer, which is someone who creates music (often electronically), and uses DJing as a means of performing live. This is common both in the modern festival circuit, and in the traditional rave scene. DJs are playing music for an audience, usually live, which involves the blending and manipulation of music and sound elements to form a final mix (or DJ set). There may be additional elements to the performance, such as scratching, remixing, live instrumentation, emceeing, video mixing, or various stage antics. Ideally, the DJ is trying to find common ground between their own musical tastes, and the desires of an audience. In a live environment, this is done by reading the crowd. For a recorded mix (or radio show, podcast, etc.) this is done via track selection… and curating followers who resonate with those sounds. The main things you need to DJ are: decks, a mixer, headphones, and speakers. Decks play the music, mixers blend the music, headphones let you cue the music, and speakers let you present the music. The most common way to start DJing is by getting a controller, which allows you to easily manipulate DJ software running on a laptop. Check out The Controller Compendium for information on how to find the right DJ controller for you, or learn about standalone decks in The Pioneer CDJ Guidebook. The first “live DJ dance party” was performed in 1943 by Jimmy Savile: a radio DJ who played jazz records in Otley, England at the Loyal Order of Ancient Shepherds on the second floor. However, American radio commentator Walter Winchell coined disc jockey in 1935 while describing Martin Block (the first radio announcer to become famous by playing popular recorded music). Theodore Livingston, also known as Grand Wizzard Theodore, is widely considered to be the inventor of the modern scratch technique. As a DJ in the 1970s, Theodore began experimenting with the Technics SL-1200 turntable. He would later describe scratching as “nothing but the back-cueing that you hear in your ear before you push [the recorded sound] out to the crowd”. Two other important names in the development of scratching are DJ Kool Herc, and Grandmaster Flash. To explore some of the earliest scratching sounds ever published, check out A Very Scratchy 80s. The “best” DJ is Martin Garrix according to the 2017 DJ Mag Poll, or Tiesto according to Forbes magazine. But in reality, polls and paychecks tend to reflect the results of marketing and popularity contests. The best DJ is the one that moves or inspires you. DJs aren’t necessarily musicians, but some musicians are DJs. A DJ does not have to be a musician to be a good DJ. But DJs who approach their mixes with a sense of musicianship, will tend towards putting existing music together in a way that creates standalone art. Why, I’m so glad you asked! The Passionate DJ Podcast is a weekly talk show, dedicated to the art and science of mixing music. Our goal is to become better DJs, together, through passion and purpose. Beatmatching is a DJ technique in which the tempo and phase of two (or more) pieces of music are aligned, in order to make a seamless transition of music. Tempo is the speed of the tracks; phase is having the tracks aligned in relation to each other. Traditionally, beatmatching was performed on turntables or CD players using the pitch controls. Sync is a tool among many in your DJ arsenal, and has been common in DJ hardware and software for years. The automation of DJ software causes a frequent fuss within the DJ community, especially amongst purists who claim you aren’t a real DJ if you use the sync button. Like all things involving artistic expression, there will be interesting and uninteresting things that you can do using the tools at hand. While software has fixed the “problem” of beatmatching, there still might be great reasons to do it. An equalizer is a volume control which only affects a certain frequency range of sound. An audio engineer uses an equalizer to help multiple audio tracks mesh together, without competing with the same auditory space. DJs do the same thing, using the three (or four) band EQ on a DJ mixer. Most modern music is made within a DAW (Digital Audio Workstation) – a fancy word for studio software. Some of the more popular DAWs include Ableton Live, FL Studio, Cubase, and Pro Tools. This program serves as the “center” of a production workflow, but can also incorporate external hardware. Side note: technically, a music producer makes music, where a DJ plays or performs it. It’s not unusual for one person to hold both roles, which is why terms like DJ/producer are common. 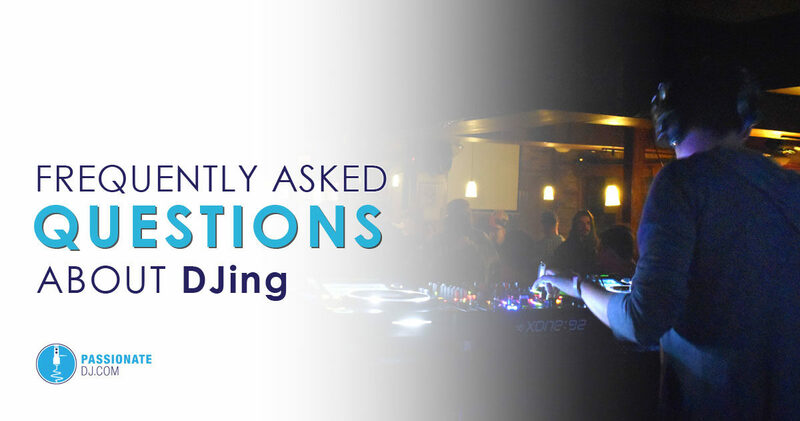 A DJ should take requests if it’s an expectation or requirement of a particular gig. Nobody expects Steve Aoki to play your favorite Drake song on your birthday, but a mobile DJ at a Sweet 16 party should be prepared for exactly that. DJs who don’t like taking requests will keep this in mind, when seeking gig opportunities. While often used by people wanting to signal their own preferences, a “real DJ” is any DJ who stays true to themselves and their craft. We talked about #RealDJs in our interview with DJ Craze, world famous DMC champion. There are four main ways to improve your DJing: gaining real life experience, polishing your technical skills, becoming more adept at crowd-reading, and prioritizing gigs which align with your personal brand and sound. Need advice about a specific struggle? Ask about it in our Passionate DJ Community Group on Facebook! If you’re brand new to DJing (or thinking about it), check out my article titled How to Become a DJ: A Beginner’s Guide. This post has helped thousands of beginner DJs to get their start, and to understand what DJing is about. If you’re looking for online courses, there are many great options available. I currently recommend DJ Courses Online*, because you get access to several courses instead of one. You’ll learn everything from DJ basics, to advanced techniques like scratching, to specific instructions on how to use Traktor, Serato, and Ableton Live. The top DJ software packages in the industry are Serato DJ Pro, Traktor Pro, and Rekordbox. Virtual DJ and Algoriddim Djay are also highly sought and supported apps, especially for home and mobile DJ users. Other popular choices include Mixvibes CrossDJ and Mixxx. There are many other great options out there. The best place to start is by downloading the software or demo, and trying it for yourself! By the sales numbers, the Pioneer DDJ-SB3 is the top DJ controller available right now. Specifically, the entire “B series” of controllers seem to be among the best selling all-in-one controllers on the market. The Numark Mixtrack 3 and Mixtrack Pro 3 are also big contenders. Extreme budget controllers (those that cost less than $100) also do consistently well, such as the Numark Party Mix, Numark DJ2Go, or the Hercules DJControl Compact. Of course, that’s just volume. The best controller will be the one that suits your needs… not the one that moves the most units. For help deciding on DJ gear, check out The Controller Compendium. I break it down by budget, so that you can compare controllers in a similar price bracket. At right around $3000, the Pioneer DDJ-RZX is currently the most expensive consumer DJ controller on the market. The most expensive “CDJ” or multiplayer is the CDJ-TOUR1 (meant for professional sound installations and festival rigs), followed by its more common counterpart, the Pioneer CDJ-2000NXS2. As far as DJ mixers, the PLAYdifferently Model 1 clocks in at a staggering $3,250. For turntables, the Technics 1200G sells for $4,000. DJs use headphones for two primary purposes: to preview tracks while browsing for the next song, and to listen to incoming tracks in order to align and beatmatch them (or prepare for a smooth transition in some way). Headphones also provide a consistent monitoring environment, which is intimate and close to the ear. Laptops are commonly used by DJs in order to run DJ mixing software such as Serato, Traktor, or Virtual DJ. Using a DJ controller, you can take charge of this software via a tactile hardware interface. Many DJ/producers also run software synthesizers, sequencers, or studio programs (such as Ableton) for live remixing and performance. Using robust DJ apps (such as Algoriddim’s Djay), you can combine your iPad with certain DJ controllers to build the ideal portable setup for your own needs. iPad DJing has come a long way in the past few years (as have tablets themselves), and has truly become a viable format. One example of a great DJ controller for tablets is the Reloop Beatpad 2* (or for four channels, the Mixon 4*). DVS stands for Digital Vinyl System, which is a DJ system that allows you to use specialized timecode records to play and manipulate your digital music files. In other words, it allows you to play, mix, and scratch the music on your laptop using a real record and turntable (or CDJ). Using software such as Serato DJ or Traktor Scratch, the computer will translate the audio signal and manipulate the digital song accordingly. Modern DJ decks (like the Pioneer CDJ-2000NXS2) are popular for a reason: they’re considered to be the “industry standard”. For mobile DJs, casual home users, or for DJs that play local shows in their hometown… it often makes more sense to invest in a DJ controller. But for DJs who play a wide range of gigs at a wide range of venues (especially those who tour), it provides a consistent and reliable setup for use upon arrival. CDJs are not inherently better than controllers. It’s a matter of preference, and budget (controllers usually get you further for your dollar). For more conversation on this, see Are Controllers Too Amateur for the Big Room? or DJ Hardware Politics. Luckily, DJing is cheaper to try than its ever been. If you already have a laptop or tablet, you can try it right now for free. All you need is some free DJ software, some free music, and some free time! And with so many resources available on the Internet, it’s easy to learn. Once you’ve given some software a try, you might be interested in expanding into your first hardware setup. For some examples of great DJ setups under $500, check out our podcast episode titled Baller on a Budget. For the complete opposite of that, check out Ballin’ Outta Control! For the sixth consecutive year, the highest paid DJ is Calvin Harris, at $48 million annually. His Las Vegas sets regularly pull six-figure paychecks, while headlining festival performances around the world can net him seven figures each time. Second in line is The Chainsmokers at $45.5 million, and third is Tiesto with $33 million. Of course, this is hardly the full story. DJing is rarely a salaried position, and pay can range from zero dollars to tens of millions. Not for everyone. Using DJing to pay your bills is a constant hustle, and there’s no health insurance or retirement packages to sweeten the deal. If you have a good business mind and a lot of drive, it’s possible to make a living by running a mobile DJ service, scoring a few residencies, or even by touring as a performing DJ (especially if you can produce good music and build a following). But, nobody ever said it was easy! The lovely thing about DJing, is you can be exactly as involved as you want. Whether you’re diving head-first into music to make it your career focus, or you just want to put together mixes in your bedroom, you can participate at whatever level makes you happy! Many DJs make the argument that taking free gigs devalues the craft “for the rest of us”. At the same time, most of us have played for free at some point. Whether it’s agreeing to DJ a sibling’s wedding, or to support a new local club night in your community, there’s no shortage of free gigs out there. How can you be paid, when so many people are willing to do it for free? First, sell something that’s better than free. Second, get serious about your Why. Third, learn how to add more value to your offering as a DJ. We dive head-first into these ideas in Competing With Freejays. Some of the most common struggles I hear from our audience: stage fright, lack of confidence, finding new gigs and venues, being unable to play a preferred style of music, knowing which software or hardware to invest in, and making money as a DJ. We also hear a lot of people ask about how to have a better work/life balance. We address the specific sticking points of Passionate DJ fans in Episode 148: Community Struggles. * Affiliate statement: this page contains affiliate links, which means I will get a small commission if you use them to make a purchase. This comes at no extra cost to you, and I only recommend products which I believe in or have tried myself.